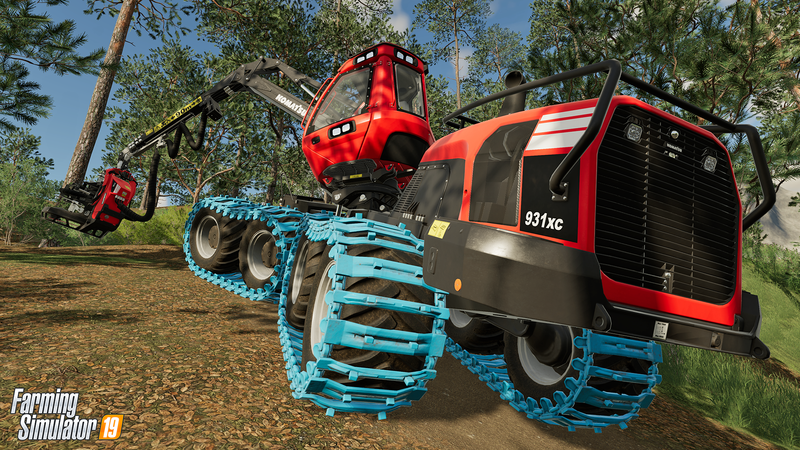 GIANTS Software has released a new video showcasing a new brand that has been added for Farming Simulator 19 – Komatsu Forestry. While Komatsu’s presence in the game was officially revealed on August 20 along with a screenshot of the Komatsu 931XC, many players may still be unfamiliar with the brand, and this video serves to provide some insight into Komatsu’s equipment. The video is quite different from others we have seen from GIANTS in the past, alternating between real-world footage of the equipment in action, an explanation of the equipment’s features from Thomas Schmelzle (Komatsu Marketing), and in-game footage of the equipment in action in Farming Simulator 19. The video first highlights the Komatsu 931XC, which is a tree harvester. The “XC” stands for “Extreme Conditions”, since the machine was designed specifically for use in difficult terrain such as loose ground and steep slopes. Footage of the 931XC shows it cutting down trees with ease, operating in a similar fashion to the Ponsse Scorpion King which was featured in both Farming Simulator 15 and 17. The second half of the video showcases the Komatsu 875 – a “forwarder” used to bring logs out of the forest to a central location where larger trucks can be more easily loaded. Players may also be familiar with this type of machine, as it is similar to the Ponsse Buffalo from previous games. Both the 931XC and 875 are truly impressive, designed for work in rugged conditions, and quickly and efficiently cutting down and moving logs. It’s really something special to see them in action in real-life footage, and then in the game – this does a great job of highlighting the meticulous work that GIANTS puts into modeling and animating the game’s equipment. The in-game footage of the machinery looks very impressive, even when shown immediately following real-life footage of the exact same action. I hope we see more of these types of videos for other brands in the future, as it’s great to see them shown off in real life and see that same work being done in-game! The collaboration with GIANTS Software is based on several pillars. For starters, a lot of modders came up to us asking for drawings, images and details regarding our machinery…at the same time, we also had lots of customers, operators and employees reaching out to us [asking] if it would be possible to integrate Komatsu into the game somehow. This was more than enough reason for us to get involved with the game, and simultaneously, Mr. Frey from GIANTS Software approached us directly to offer a collaboration. This quote shows me that the popularity and reach of GIANTS and the Farming Simulator series continues to grow, and reinforces why I think this year is the “Year of the GIANTS”. GIANTS indicated that they wanted to make this type of video so that players who are not familiar with all the brands and vehicles get to know them better so that they become acquainted with the equipment and are more excited to use them in the game. Personally, I always find GIANTS’ videos to be incredibly well-made and engaging, and this one is no different. The cuts between real-life and in-game footage are excellent, and the music helps build the atmosphere – overall the video simply gives a sense of just how incredible (and useful) these machines are, and it very much does make me excited to use them in the game. Mission accomplished, GIANTS! Scholarly Gamers will be providing coverage of any and all Farming Simulator 19 news in the lead-up to the game’s November 20 release date, so stay tuned for more!